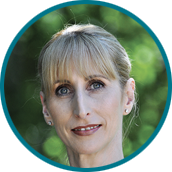 Dee May is the General Manager for GastroIntestinal Endoscopy (GIE) and Brisbane Endoscopy Services (BES). Dee joined the group in March 2017 and is responsible for the day-to-day operational and strategic management of the organisations. Gaylene Jackson is the Finance Manager for both GIE and BES. Belinda Laurie provides executive support to Dee. Vicki is the GIE Administration Team Leader located at Brisbane Endoscopy Services Sunnybank. Joining her are GIE registered nurses responsible for prep appointments. They are supported by the friendly BES and GIE reception, bookings and administration staff. Our caring and professional clinical nurses complete the BES team. They provide valuable and efficient support to the Gastroenterologists and their respective clinical and administrative team members. 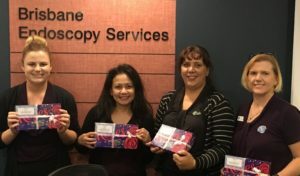 Some of our wonderful staff receiving their gifts of appreciation on Administrative Professionals’ Day and International Nurses Day. Sue is the Administration Team Leader at GastroIntestinal Endoscopy Chermside. GIE commenced services simultaneous to the opening of Chermside Day Hospital, in September 2008. The GIE administration and prep nursing staff work collaboratively to offer a comprehensive Open Access service to patients and their referrers within our community. 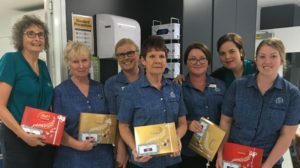 They are also supported by the Chermside Day Hospital reception and nursing teams. Katrina is the GIE Administration Team Leader at the North West Private Hospital. She is supported by the experienced administrative staff and the GIE prep nursing team in delivering a seamless patient care experience in the newly renovated day surgery and endoscopy facility. The GIE team provides a very efficient and friendly service for the Gastroenterologists, the patients and their families, as well as ably assisting the local referring medical community. There is a long standing history of local GP support which is very much appreciated by the Gastroenterologists and North West Private Hospital. Our Gastroenterologists believe this support is very much the result of the hard work, attention to detail and friendliness provided by Katrina and the team. Lana leads the GIE administration team at the Wesley. The Day Surgery and Endoscopy Unit, are located in the East wing of the Wesley Private Hospital. They provide an extremely efficient service which is reflected in the care and attention provided to all patients and staff at the Wesley. Our registered nurses are available to explain the diet and preparation for your procedure. All colonoscopies are preceded by a consultation with a registered nurse (RN). GIE policy is that the nurses are registered with the Australian Health Practitioner Regulation Agency (AHPRA). At the preparation appointment, our experienced RNs complete a comprehensive review of the patients suitability for the Open Access procedure and provide the patient with information regarding the preparation and diet. These RNs are an integral part of GIE and the quality care that patients experience with our service. Annette is responsible for coordinating all advertising and promotional activities for GIE as well as liaising with our referring doctors. Our 1300 number is a central number for all patients to phone to arrange their appointments. On phoning this number you will hear a number of selections for your call to be directed to one of our four locations. Please choose the location you wish to arrange your booking with or should your inquiry be of a general nature please hold and one of our friendly administration staff will respond to your call.